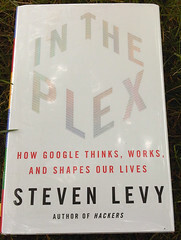 Having read three books written by Stephen Levy (Hackers, Crypto and Artificial Life) already I was excited that he had a book coming out about Google. I always thought that pagerank was named like that because it was the rank for a page…guess what? The person who came up with this ranking algorithm is Larry Page….mmmm now pagerank is a name that makes sense in a different way. Don’t be Evil..you will learn how that was picked, I won’t spoil it here. Stephen Levy was given unprecedented access to the people on the Google campus for 2 years while writing this book, it shows, there is so much detail in this book that you are thinking that you are actually there. I would say that if there is one book that you want to read about Google, then pick this one, it is the most complete book so far. I highly recommend this book to anyone who is interested in technology, I also recommended it to some people at work who are managers to learn about how Google manages people and how they think about software and hardware, the workplace and what should be available for employees on campus. It is a quick and easy read, I was done with it in a couple of days.